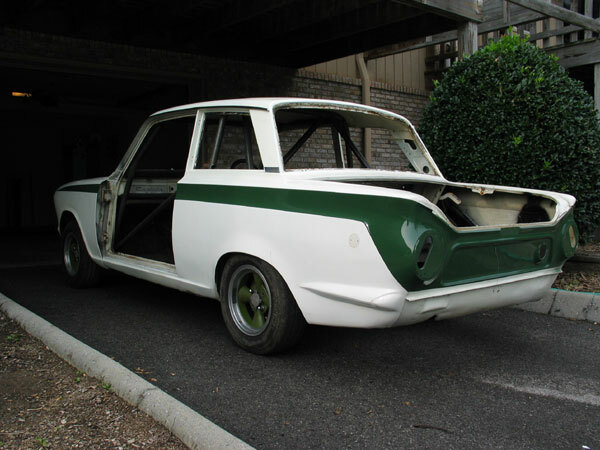 "A friend pointed out an advert for this car in "Grass Roots Racing", knowing I had already looked at and rejected 5 other for sale cars - I really wanted an early Mk1, and originality rather than cosmetic restoration was my focus. All of the aluminum panels were still on this one - real neat ! A big selling point for me. And I actually know nearly the entire owner history - even have the advert for it in an English magazine before it crossed to the USA." "First registered EPT436B in the UK on 10th May 64 it appears to have gone through at least two hands, the last being David Chennels in Chelmsford, before it was exported to the US in October 1985. The first owner in the US was Chris O'Donnell Engineering in Irvine CA for about 4 months, after which it went to John Kelley in Baltimore, Maryland between March 86 and September 93. Bob Attrell of Toronto Canada then purchased it and modified it for Vintage racing, where it became well known, as it spent time in the Canadian Hall of Motor racing Fame. I purchased the car from Bob in February 2001, raced it once, and decided it needed an extensive restoration, now underway. 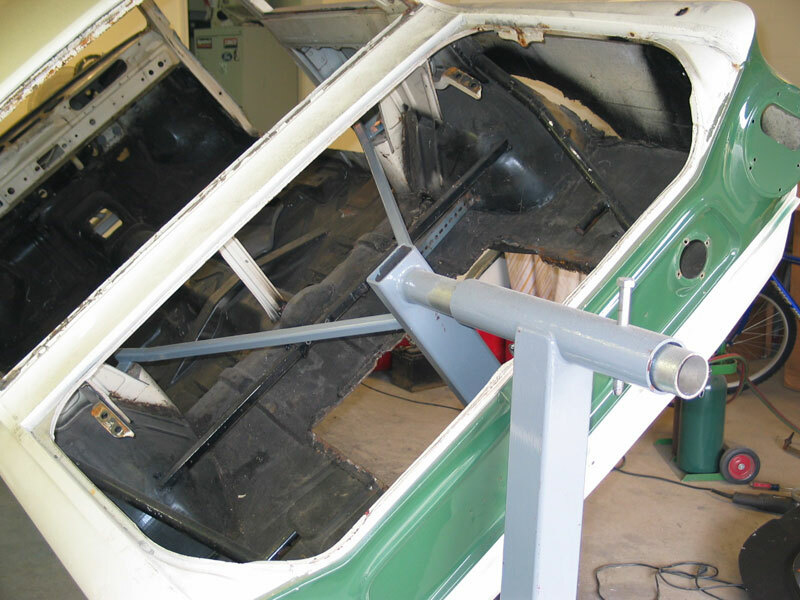 When we pulled the Bob Attrell-installed roll cage, to install a new cage, we discovered that it had had a different rear cage bolted in earlier in its life. So it possibly spent time as a club racer in the UK for a while. Anyone recognize some of the names in this ??? Please contact me if you do." 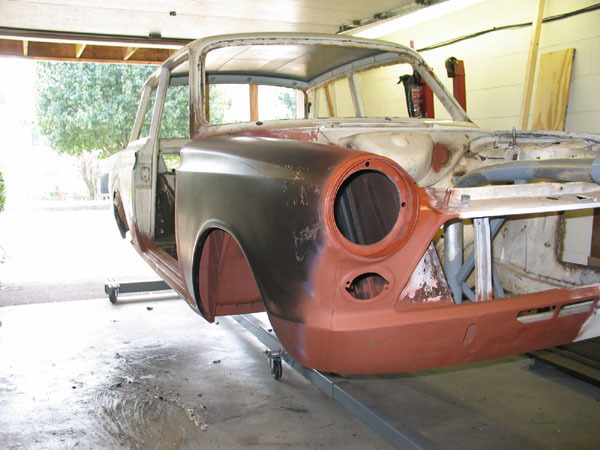 "With the car now totally stripped and ready for the spit, what is interesting is the specific telling signs of this being an early A-frame pre-aero Lotus Cortina. 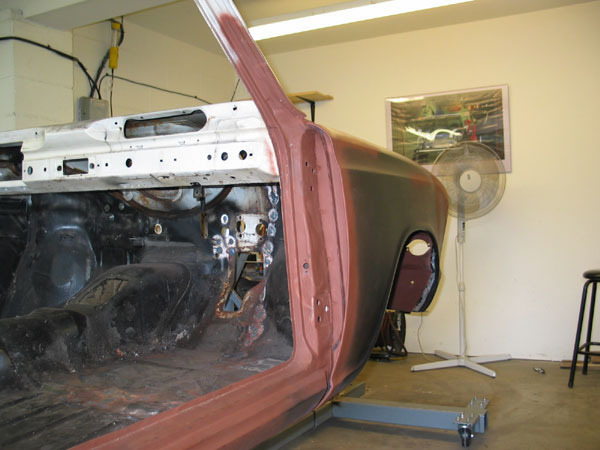 There are the transferrable components - engine, transmission, and aluminum skinned doors, boot and hood. The aluminum hood has four holes drilled in it for securing pegs. As the inner hood stiffener is bent around the hinge mount area - it tells a tale ! I am going to have these holes welded up and go to the more period twin hood straps at the front with hinges at the rear (aluminum welding is not my forte... ). All the other panels (doors and trunk lid) are just pressure dinged. 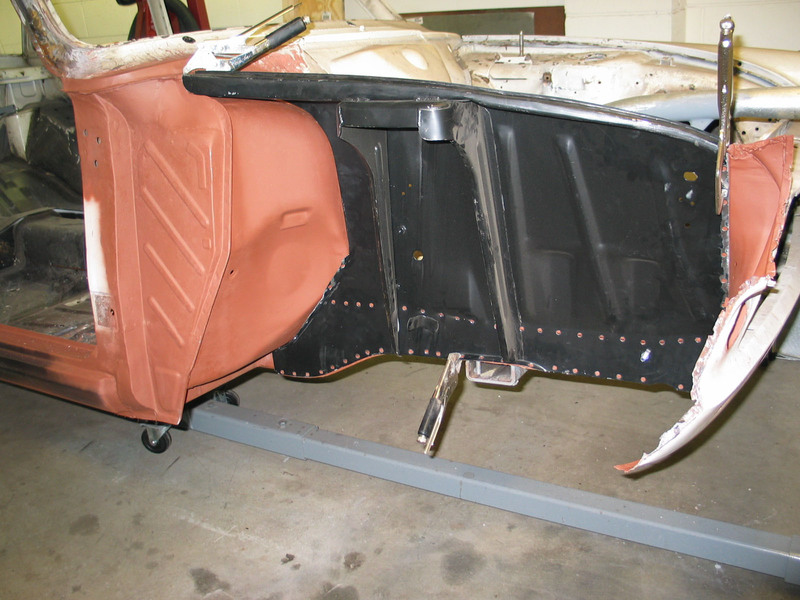 But also note in the picture below on the left, the welded-in hump in the rear trunk floor for differential travel." 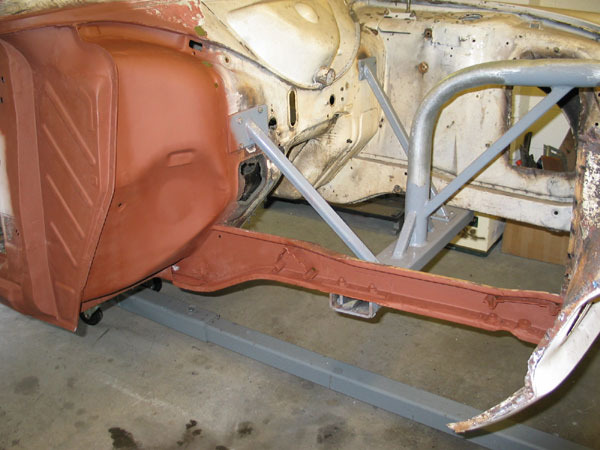 "Also, note the chassis stiffening tubes from the inner rear wheel wells to the rear chassis rails, and the one everyone misses - in the photo above on the right, the tube chassis stiffeners from the rear wheel arches forward to the chassis rails inside the rear panel area. The latter are almost totally impossible to duplicate as the tubes are welded in prior to fitting the outer skin. The welds on the vertical stiffener are around the back of the tube - not even the best welder could weld around corners in an unseen area." "As can be seen by studying the above photo, it’s time to replace those front inner wings. The repairs done to the upper strut area of the inner wings, and various "modifications" for air cleaner clearance on one side, and for oil tank "cooling air-flow" on the other, means it will be easier to replace the inner wings than to try and repair them. At that same time, the outer wings can also be replaced." 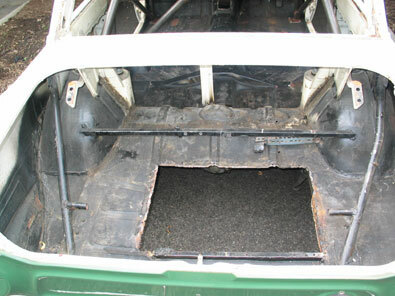 "A desire to go back to the original fuel tank, with a bladder inserted, will require replacement of the "modified" trunk floor panel. 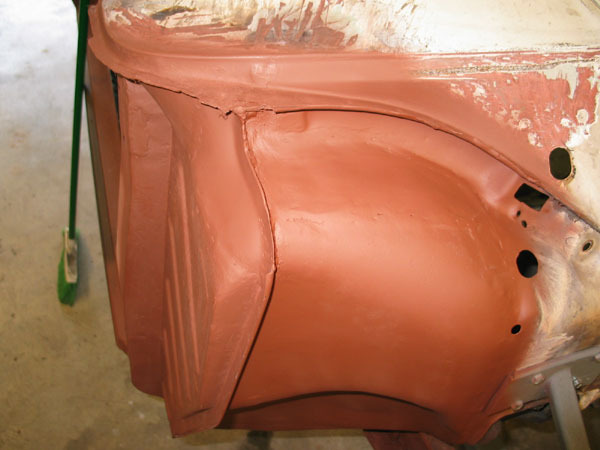 The rear lower quarter panels are going to be returned to standard without the flares, and the rear valance is to be replaced to cure the results of earlier accident and a hasty repair." 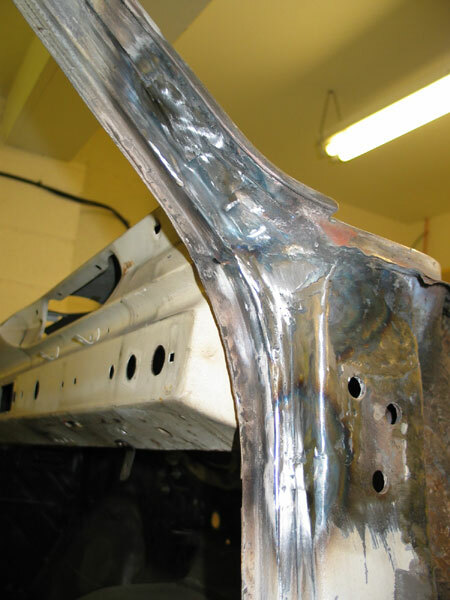 "While we are about it the front A panels, outer sills and chassis outriggers have the usual tin-worm marks. All will be replaced." 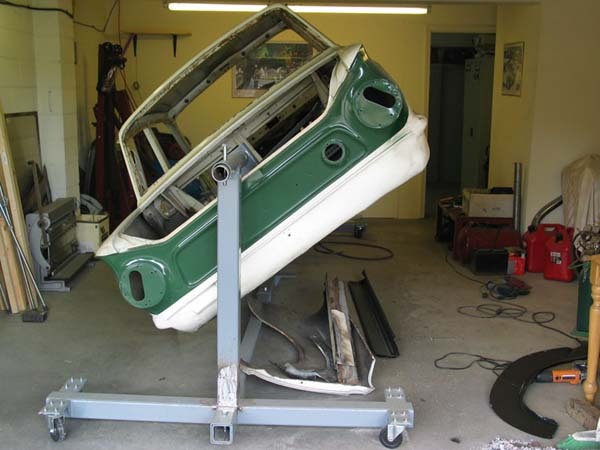 "Once the car is up on the spit, and removing the panels is in progress, I will get more photos to you." "The important part in getting it up on the spit, is to make it both stable, and ensure as best as possible that it is safe, and that the supporting ironwork doesn't get in one's way when working. At the same time because this rust bucket is going to have some serious structural repairs done, there is a number of precautions that need to be taken. Looking at the front mount point that picks up the weight on the cross member, note the triangulated bracing to the bulkhead. This was done to prevent the chassis rails from buckling when the inner and outer wings are both removed. More about that later. The rear pickup is on the rear spring hanger points and the upper shock tower points." "Once the body was up on the spit, one interesting point came up. It was almost impossible for me, on my own, to turn it to the full 90 degree point. This started some interesting investigation, as the pivot is exactly in the axial center of the body. So where is the Centre of Gravity on this body? Playing around with a lot of crude measuring rigs, and bringing back some of my Applied Maths, I eventually figured that it was about 4 to 5 inches above the lowest floor pan level (about at the level of the top of the centre tunnel) . That is really low - no wonder these wonderful things handle so darn well !" "Needless to say, the sight of a car in the air at a 45 degree angle has drawn a lot of interesting comments from passing neighbours !" "So the first job is to atack the removal of the "outer skin" and address the underlying skeletal issues! First off, the job should sensibly be aproached one side at a time. While the temptation is to remove everything on that side all at once, it is possible that this will lead to the poor thing starting to buckle for lack of side strength. So the trick is to remove the skin - outer front wing, outer sill, and rear arch outer panel section first." "I figured the best way to work, was from the inner sections outwards. 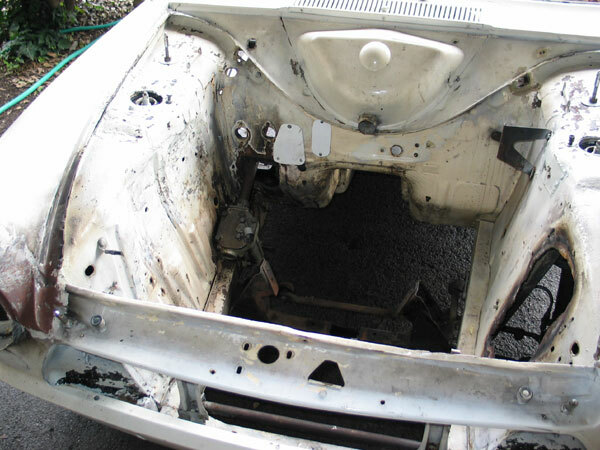 The inner sill needs replacing, parts of the floor around the "Chassis outrigger" and the front jacking point need attention - the photos will scare anyone !" 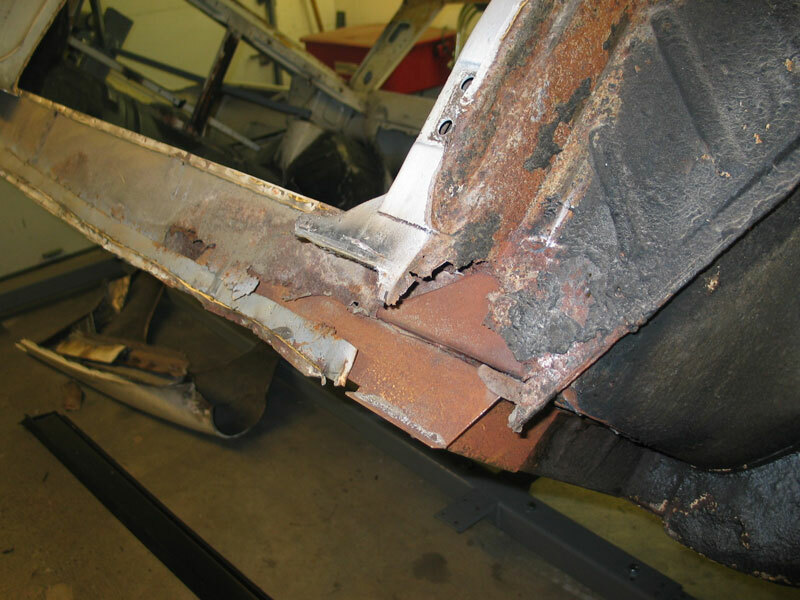 "Having repaired the floor rot around the chassis outrigger (the front corner of the floor had been well repaired recently, so this was left in place), the rotten outrigger section and jacking point were cut away, and the new (Ex-pressed panels) welded in place. 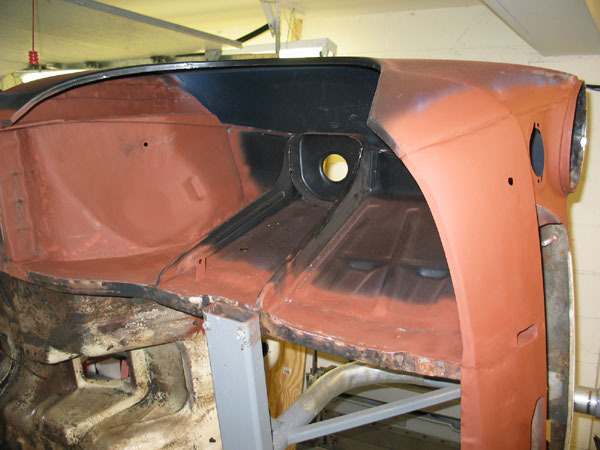 While we were about it - the section of the door "A panel" upright above the hinge had been "Bondo repaired" and the clean-up revealed this huge hole, along with some rust through the inner door side screen surround. This took an entire weekend of fiddly fabrication and delicate welding. Earlier in it's life the outer edge of the screen had also been repaired, but a bit of clean up there revealed a solid repair." "Two problems presented themselves with the outer sill. The outer sill top edge was a little wider than the original sill edge, so this had to be flatted and re-bent to match. 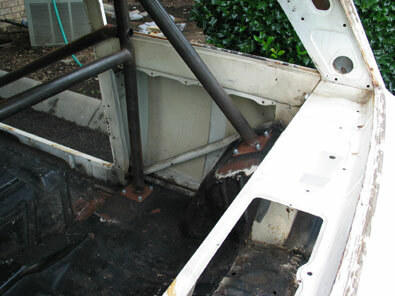 The second problem is that the front edge of the sill (where it meets the inner wheel well) is open. The latter proved easy enough to close off though." "Next on the bill is the inner and outer front wing - Oh boy ! Look at this hole (above the pedal area) in the top of the footwell ! My neighbors are getting a pool going - pick the year I'm going to finish................"
"As it turns out the damage to the "upper footwell area" was a lot easier to repair than one would expect. 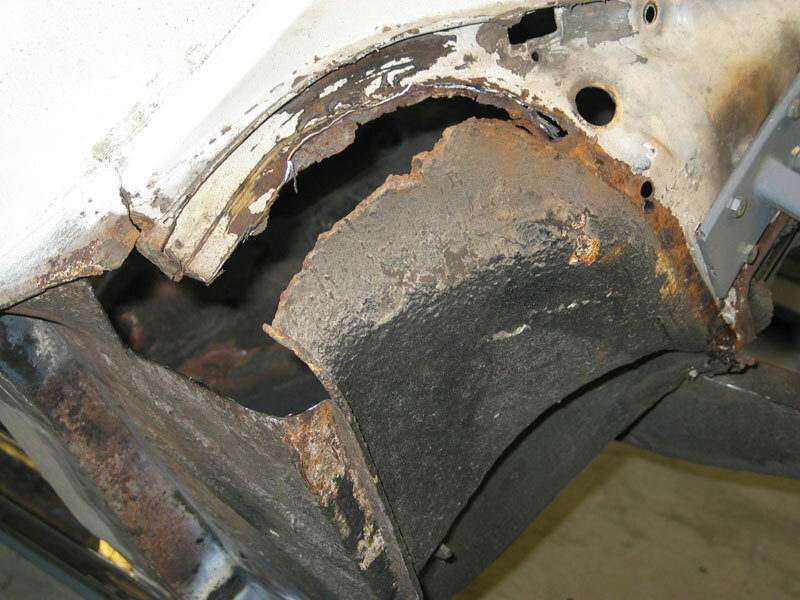 Once the whole area had been cleaned up, the rust hole was cut back to solid metal areas, which enlarged the missing-metal by another 50%. And as the area was not a compound curve, it was easy enough to make a template and cut new metal to fit. A lot of fiddly tacking and welding- and all fixed! The top of the kick panel is a compound curve, however, and that was repaired with a section cut out of a new repair panel made for the job, supplied by Ex-pressed Panels." "This was also a good moment to closely examine the chassis captured nuts for the cross member and the front stabilizer. In this case, one nut was stripped out, so a replacement was fabricated out of mild steel stock, drilled and tapped and welded in while the chassis rail was open. By the way, if you need to do this, don't just weld in a nut - the heat shrinks it, and further hardens it, and you will never get a tap through it again..."
"So now finally we were ready for the all important job of fitting the new inner and outer wings." "The inner wing panel is considerably more important than any other on the car, and it is important to get it lined up right, and to make it as solid as possible between the chassis rail and the bulkhead. Despite what people say about the possibility of mis-alignment of the inner wing, (remembering that the strut hangs off this item), you really would have to try hard to misalign it. 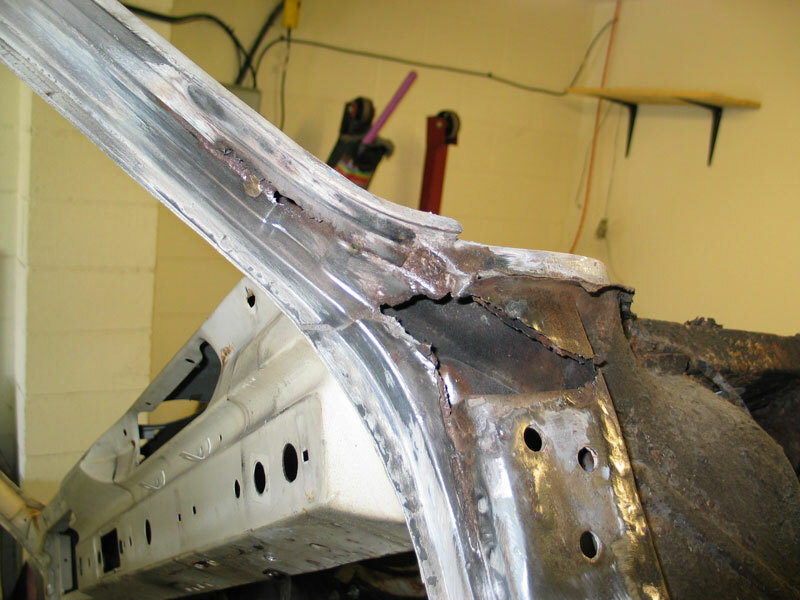 This again assumes that the car has not suffered front end damage, which would be immediately obvious when the new panel is lined up to the chassis / bulkhead - if the Chassis rail doesn't line up, then something is bent." "In the case of this car, the inner wing lined up perfectly with all of the various touch points!" 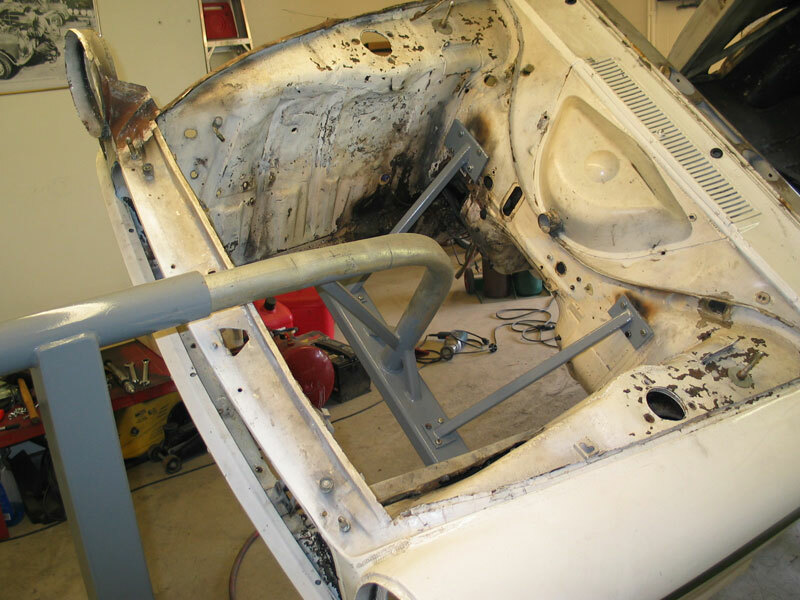 "As stated, the panel must be welded on as solid as possible... and it was. Looking at the photo it can be seen that the weld-through holes are spaced 1" apart on both faces and a lot of care was taken to ensure that there really was deep penetration through and into the lower panel, before closing off the hole. 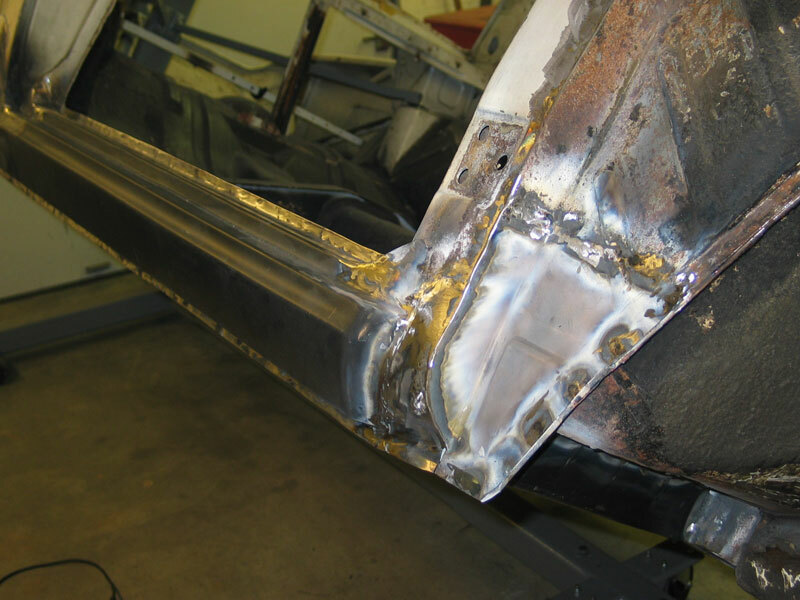 The top edge of the panel where it joins the bulkhead/ upper footwell was welded down the entire edge until the contact point with the vertical section." "The outer wing is an entirely different issue! It does not add enormously to the strength of the shell, but appearance here is primary. Get it right and the car will always have that indefinable "right look". Get it wrong and it will stand out "wrong" like a sore thumb! As the front outer wing needs to line up with no fewer than five other panels as perfectly as possible - (the door, the hood/bonnet, the front scuttle valance along the seam edge, and the headlight mount ring, and the front valance) time must be spent. It took nearly 12 hours of fiddling, fafing, and constant on-and-offing to get this one right. This car has previously had both front wings replaced (badly) and the result was that the mating edge of the front valance to the outer wing was wasted, and had to be fabricated and replaced before fitting this outer wing. Additionally (as with a lot of Cortinas) the mount plate that runs down the door pillar to accept the outer wing was rotten and had to be replaced. This in itself presents a real challenge, as it needs to be fitted correctly to accept the outer wing- the best way to get this right is to fit the outer wing correctly lined up, and then fit the mount plate with the wing in position. As I said it's a lot of fiddly work ..."
"The best early observations never lead to a 100% hit on the required repair components. Unfortunately the outer portion of the rear wheel arch had been badly repaired, and really called for replacement - Oops! didn't order that part. 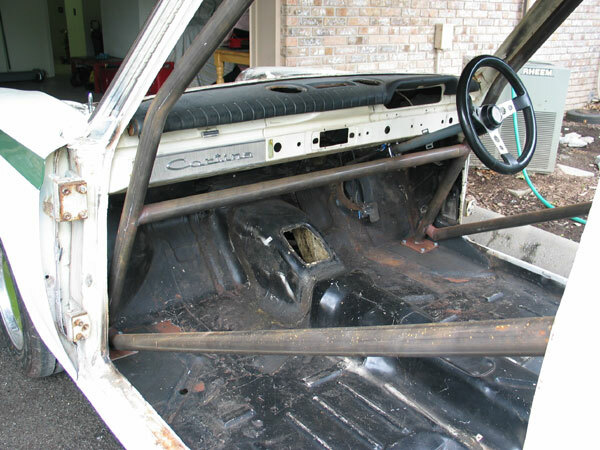 This is an early "A" frame car, and the A-frame front attachment point is on the rear chassis rail, which is also the mount point for the rear axle tramp bars (which are much longer than on the later LoCorts). Sadly, this also is a big rusting spot. 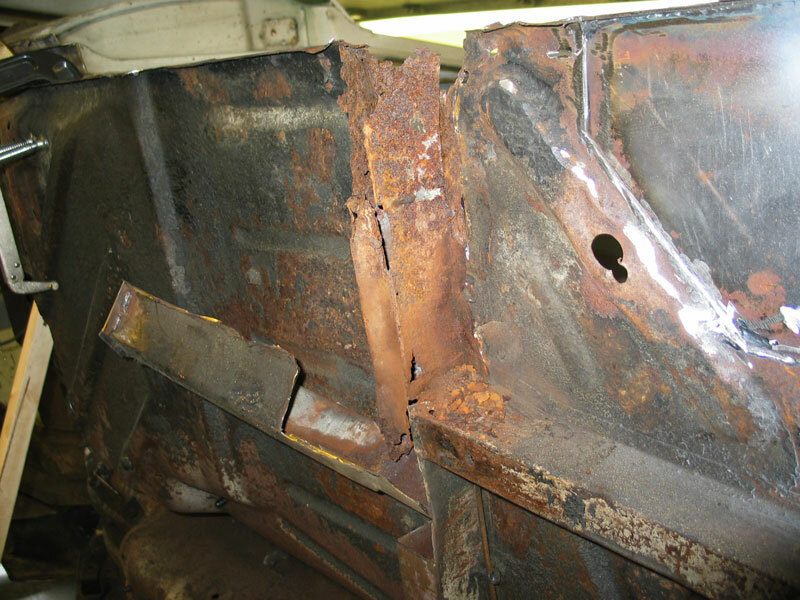 In this car the LHS had been repaired, and some of the original metal remains there, but the RHS has all but been replaced. As the car was also converted to leaf there are additional holes drilled to accommodate the shorter "GT" type tramp bars, and these areas are pretty well graunched. Time for new mount points - Oh yes another un-ordered item ... So time for a break."